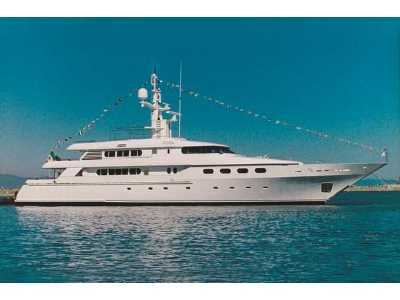 112' Motor yacht accommodating a total of 12 guests in 5 separate cabins, and 6/7 crew in 4 cabins. The master cabin is situated on the main deck forward, with 4 en-suite guest cabins below decks (2 VIP double cabins with en-suite shower rooms, and 2 twin cabins (with 2 single beds + 1 Pullman bed) one with en-suite shower and one with en-suite bathroom). The salon/dining room is open plan with a finger bar separating the 2 areas. It is equipped with a 42” JVC Plasma TV retractable from cabinet. The galley is situated on the main deck and leads to the crew area below decks forward. 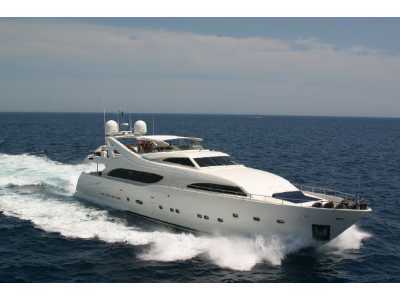 Undoubtedly the finest example of a pre-owned Ferretti Custom Line 112' on the market. Maintained to super yacht standards with no expense spared.